Full color 58 honey bee and related pictures. 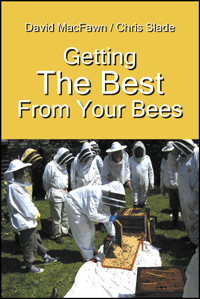 This book is for the beginner through advanced beekeeper. 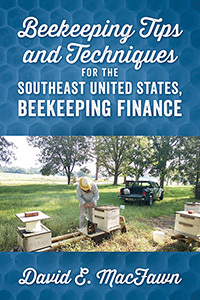 After 50 years of working with bees in mainly the southeastern United States, my aim in writing this book is to provide useful tips and techniques on bee keeping and production with special attention to its financial dimensions. Such information should be helpful to the advanced beginner as well as the experienced professional. However, since all beekeeping is local, some of these tips and techniques may not work in every area. In addition, beekeeping finance should be understood to succeed in building and growing any beekeeping operation. Many bee businesses fail due to poor financial controls and planning. Successful bee keeping first requires a basic knowledge of bee biology and physiology. Once acquired, specific management and financial techniques may be applied. In other words, the beekeeper’s management must support the bees’ natural biology. If the beekeeper does not do this, he will lose his bees, and everything else will be for naught. Once a bee keeper understands the bees’ biology, the current management techniques should be examined for financial efficiency. Optimizing your beekeeping finance is critical for operating a profitable honey bee operation. We are competing not only with domestic United States beekeepers, but also overseas beekeepers. The competition scene is different for honey production than pollination. Honey production has much more overseas competition, whereas pollination is more domestic. There are many small honey producers that compete with local honey that is in demand. Likewise, much pollination is local also, with smaller acreages. David E. MacFawn: David has kept “Dark German” bees, Italian bees, Russian bees, and both Italian and Russian hybrid. He is a North Carolina Master Craftsman Beekeeper and co-founded the South Carolina Master Beekeeping Program. 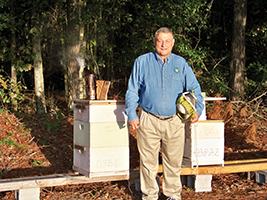 He was selected as the 1996 South Carolina Beekeeper of the Year.